But you, when you pray, go into your room, and when you have shut your door, pray to your Father who is in the secret place; and your Father who sees in secret will reward you openly. And when you pray, do not use vain repetitions as the heathen do. For they think that they will be heard for their many words. “Therefore do not be like them. For your Father knows the things you have need of before you ask Him. In this manner, therefore, pray: Our Father in heaven, Hallowed be Your name. Your kingdom come. Your will be done On earth as it is in heaven. And forgive us our debts, As we forgive our debtors. And do not lead us into temptation, But deliver us from the evil one. For Yours is the kingdom and the power and the glory forever. Amen. I remember the first time I prayed, how awkward and unsure I felt. And pray over a group? I would have passed out. My conversations with God have come a long way since then, but one thing hasn’t changed. I don’t need a special formula, or a certain kind of religious etiquette when I pray. God is crazy about me. He loves hearing from me morning, noon and night. The most important thing about prayer is doing it. Our world has distorted what communication with God looks like, relegating Him to someone that we only call on in times of trouble or when we want something, as if He’s some big Santa in the sky. 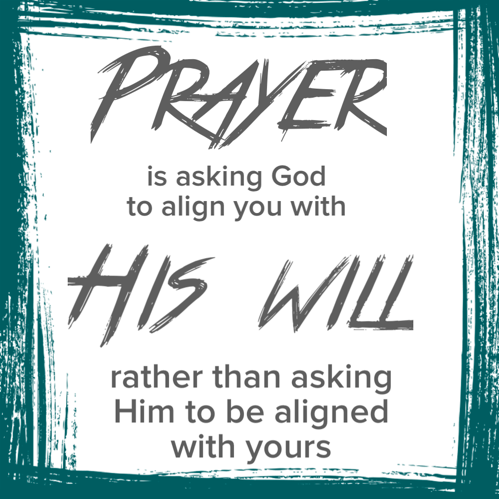 Prayer isn’t magic, and Gods not a genie, waiting to grant our wishes without regard to what’s best (aka His will). It isn’t about making demands or striking up a bargain with Him, either. Prayer is about communicating humbly, worshipping wholly, and seeking Him sincerely, knowing that we serve a God that hears, loves, and responds to us in every way possible. He may not always answer the way we ask, but He will always lead us to what’s best. I thank you for the great privilege we have as believers to come before You in prayer. No matter how great or small our concern may be to others, We can trust that You, Daddy, are always eager to hear from us. Blessed by this. Received this twice in one day. God is speaking to me about my prayer life. Thanks.